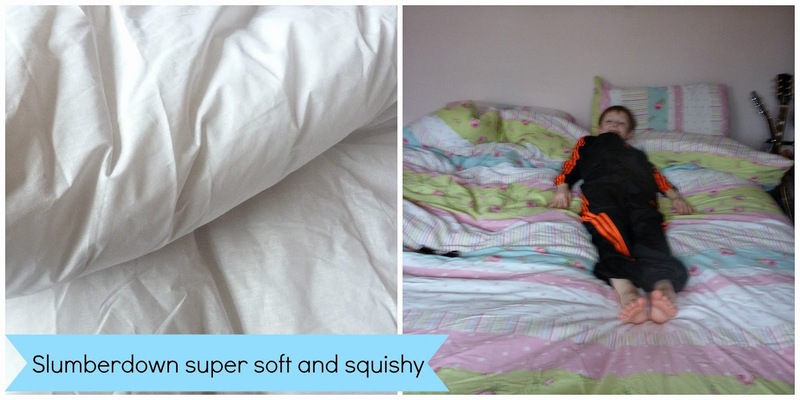 Yesterday saw the change of are old duvet that we had for 8 years to a new slumberdown easywash 10.5 tog duvet! I didn't realise until I took it off it was a 15tog duvet, I wasn't surprised as I like to be warm and cosy I try to wrap myself up in the duvet as much as I can before I get complained at! I slept really, really well with the new duvet, in fact I've just thrown my 15 tog in the bin. This duvet somehow kept the heat in and kept me super warm. I didn't realise how heavy my old duvet was. It felt so much more relaxing without a heavy weight. These aren't the best picture ever my camera was playing up with the light behind me. Leon was the first to try out the duvet. He thought it was soft and squishy. In fact he's not stopped going on about him having a new duvet! I'm really pleased with the new duvet and would recommend it. Another great feature is that its washable and it can even go in the tumble drier, saving trips to the launderette. One of my resolutions this year is to de-cltter and recdecorate my bedroom and this has insprired my to keep going. Its a lovely freshen up to the room.